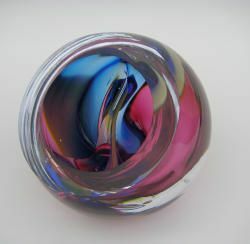 Over the last 15 years I have developed my own unique relationship with the glass. 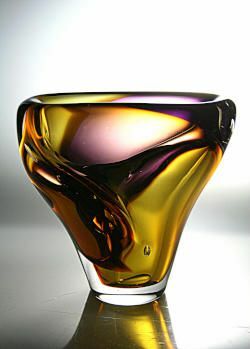 As a medium, glass speaks differently to a glassmaker than to designers and artists. 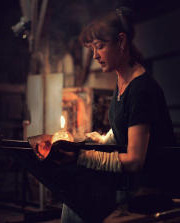 Glassblowers are in the unique position to touch the glass; to feel it move and react. It is a very personal, intimate connection. 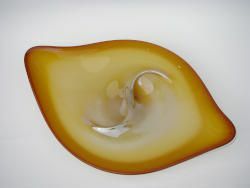 The fluid nature of the glass combined with the ability to form it, inspires me. The sleek, classic, high quality design that is traditionally known as ‘Leerdam Style’, also inspires me. By combining both form and fluidity, I’ve created my own style here in Leerdam…with a twist! Born in 1972 in the USA but has lived the last 20 years in The Netherlands. 1995 graduate of the University of California with a degree in Design. 2003 – 2008 received on-the-job training at Het Glascentrum, Leerdam, The Netherlands. 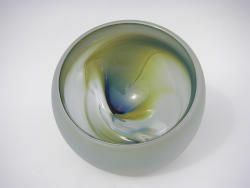 A unique environment to work and learn from both Dutch and Czech glass masters, as well as various international blowers which the studio hosted. 2004 three-week intensive glass course which included blowing, cold working and glass technology at Glass School Novy Bor, Czech Republic. 2012 – current Nationaal Glas Museum/de Glasblazerij, Leerdam, The Netherlands. This includes demonstrations for the public, working with artists, production and education/workshops.